At the corner of Ocean and Arizona streets, as waves from the Pacific crashed to the shore below us, my sister Sara and I turned to our left. We stopped dead in our tracks and fell uncharacteristically silent. Behold, the magnificence of the Santa Monica Farmers Market. We slowly walked its length, our heads swiveling left, then right, agog at the rainbow-colored bounty. Neither of us had ever seen a farmers market of such breadth and depth. And she’s seen a lot of farm-fresh food, having adopted California as her home two decades ago. My own neighborhood farmers market, in the Del Ray neighborhood of Alexandria, Va., suddenly seemed … inadequate. A bit of history. The Santa Monica Farmers Market was established in 1981 and now boasts 700 vendors, all certified as California growers. Their booths sprawl across a dozen city blocks. The market draws local chefs as well as hungry visitors like us, sampling a little of this, a little of that. Avocados grown in nearby Morro Bay. Pistachios from just up the road, flavored with lemon chives or habaneros. Almonds with a hint of orange rind or rosemary. 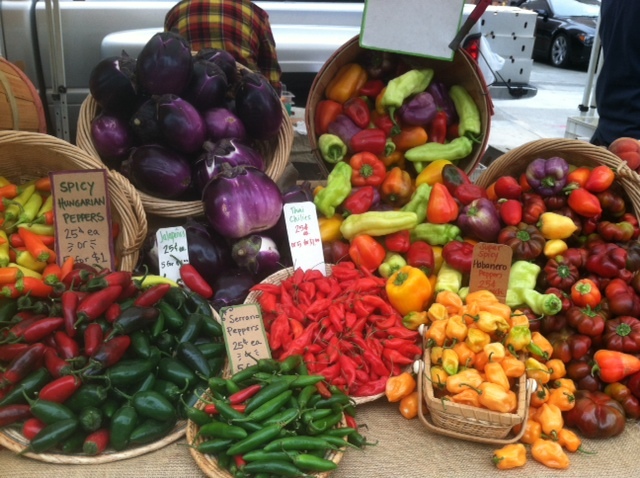 A cornucopia of peppers, from serranos to pablanos and hatch. Asian pears, bosc pears, seckel pears. Dates still on the stem – I didn’t even know they grow in clusters, like brussel sprouts (also available, of course). A dozen types of peaches. Apples too. Mounds of squash blossoms. Fresh-picked pomegranates, $1 each. Three kinds of juicy clementines, each with a distinctive flavor. Melons, dragon fruit (! ), giant grapefruit, oh my. We bought bags full of food, and feasted for lunch. You leave this market inspired, whether you’re a restaurant chef or an amateur. We had briefly cruised the small Sunday market for some fruit to nosh during our visit, and our son told us then: Wait, the Wednesday market is world-renowned, for good reason. He’s a smart kid, that one. Are those purple thingies also peppers?